As a team, Martin Laciga and his older brother (Paul) played in the second most FIVB (117) and SWATCH stops (115) in history. The Lacigas teamed from 1995 through 2004 to place fifth in two Olympics (Sydney 2000 and Athens 2004) while competing together in four SWATCH-FIVB World Championships (1997, 1999, 2001 and 2003) and the 1998 Goodwill Games in New York. The Lacigas won six international gold medals together (five SWATCH titles and a 1997 FIVB Challenge crown in the Czech Republic). 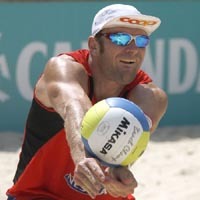 Martin Laciga earned SWATCH-FIVB World Championship silver medals with Paul Laciga in 1997 at Marseille, France. Sandwiched between bronze (1997 Italy) and silver medal finishes (2001 Italy, and 2002 Switzerland), the Lacigas captured three-straight European continental championships (1998 Greece, 1999 Mallorca and 2000 Spain). Martin Laciga also won a SWATCH-FIVB World Tour event with Markus Egger in 2005 at Stare Jablonki, Poland, followed by FIVB Satellite gold medal four weeks later in Vaduz, Liechtenstein. Martin Laciga is the son Paul and Judith Laciga. He and his wife (Claudia) have a son (Jan, born December 31, 2004). Claudia Oliveira Costa Laciga competed five seasons on the SWATCH-FIVB World Tour (1998-2002) for Brazil by earning $36,250 for 18 events with career best finishes of fifths with Jackie Silva and Adriana Bento Buczmiejuk. Claudia and Jackie placed ninth on the SWATCH rankings 2001 as the No. 3 team from Brazil.